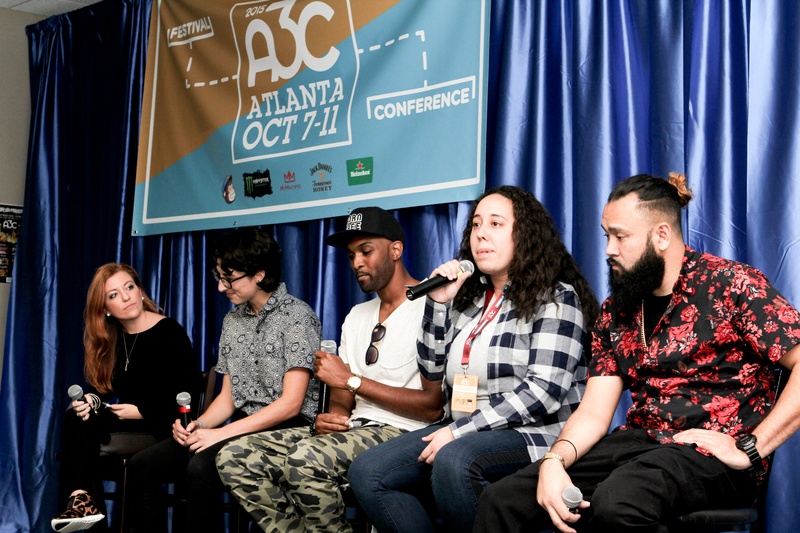 What should artists consider when marketing themselves? Mike: The more specific you can be, the better booking venues and promoting yourself will be. Brianna: Right now, the types of artists that are popular are the ones who are very present on social media. Ari: Artists who are more inclined to connect with their fanbase are more appealing. Kaylee: As artists, you can speak to your fans more than a venue can; you can promote your shows, but don’t inflate your prices. Also, avoid putting all of your friends on the guest list, because you make a profit when people buy tickets. What should an artist do to prepare for performances? Brianna: Record performances of yourself and watch them. Would you pay to see your performance? Kaylee: Perform in front of people who will give you real feedback and concrete criticism. Do not just perform in front of your friends and family because their judgment is clouded with their personal thoughts of you, making their opinions of you as an artist biased. Brianna: If you are going to open up for an artist, [do your research before and] make sure it is an artist that shares a similar fanbase as you so that you will be appealing to the audience. Ari: Artists should make their performance entertaining and focus on keeping everyone’s attention. Be "undeniable." Mike: Things that are appealing in performances include having a lot of energy and playing into production. When you’re in tune with the production people, [it really shows onstage]. Kaylee: Always have people in the audience. It looks bad from a video standpoint if you don't have anyone there watching you perform. Also, when you're performing, make moments when you're onstage and connect with people. Think about the artists that inspired and captured you before you became an artist. What’s your best advice for interacting with promoters? Ari: Think everything through before you book a venue – plan ahead. Make it simple for everyone: how many people are you bringing, how can you make it worth it for the venue? Details with no fluff are the best. Mike: Promoters want people who are good, whether you bring 100 people with you for the crowd or not. However, when it comes to being offered a gig by a promoter, make sure to keep asking questions, especially before deciding to commit to a promoter. You, as an artist, do not want to be put in a position [where] you're not fully aware [of a situation]. Are you being marketed correctly? Are you being promoted fairly? What's one piece of advice that you'd like to give to new artists? Shaun: Take chances if you're talented. Brianna: Take note of what you love about a specific performance. Mike: Be humble and cool – you'll learn more about yourself that way. Also, ask yourself, "What can I do to get better?" Kristen McHale is an intern for Sonicbids.